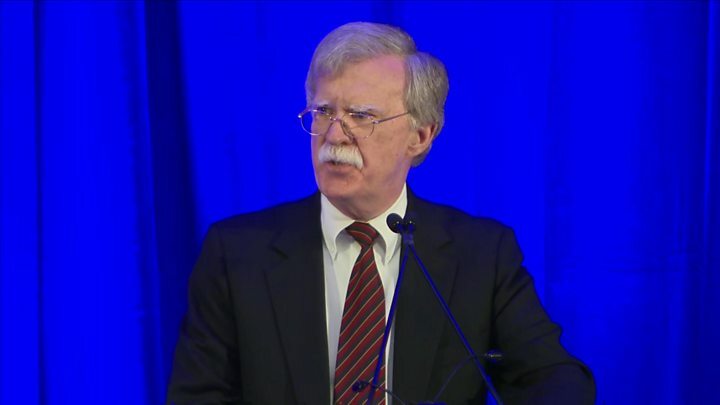 Media captionBolton: "The ICC is dead to us"
The US has threatened sanctions against the International Criminal Court (ICC) if it goes ahead with prosecutions against Americans. National Security Adviser John Bolton called the court "illegitimate" and vowed the US would do everything "to protect our citizens". The US is among dozens of nations not to have joined the court. The US has been critical of the ICC since it was established - and Mr Bolton has been particularly vocal in his opposition to the court. In his speech on Monday in Washington, Mr Bolton attacked two areas of the court's work. The first was ICC prosecutor Fatou Bensouda's request last year for a full investigation into alleged war crimes in Afghanistan, which would include any committed by US military and intelligence officials. Mr Bolton said neither Afghanistan nor any government signatory to the ICC's statute had requested an investigation. The second area Mr Bolton addressed was the Palestinian move to bring Israel before the ICC over allegations of human rights abuses in Gaza and the occupied West Bank - a move dismissed by Israel as politicised. Mr Bolton said the Palestinian move was one of the reasons the US administration had decided to close the Palestinians' diplomatic mission in Washington. Was a threat to "American sovereignty and US national security"
Lacked checks and balances, claimed "jurisdiction over crimes that have disputed and ambiguous definitions" and failed to "deter and punish atrocity crimes"
Was "superfluous" as the US administration did "not recognise any higher authority than the US Constitution"
More "binding, bilateral agreements" would be signed to stop countries submitting US citizens to the court's jurisdiction. The ICC has pledged to "continue to do its work undeterred, in accordance with... the overarching idea of the rule of law". "The ICC, as a judicial institution, acts strictly within the legal framework of the Rome Statute and is committed to the independent and impartial exercise of its mandate," it said in a statement, referring to the treaty that established the ICC. Liz Evenson, associate international justice director at Human Rights Watch, told AFP news agency that Mr Bolton had shown "callous disregard for victims of atrocity crimes" and that the US was "more concerned with coddling serial rights abusers... than supporting impartial justice". How have previous US administrations dealt with the ICC? The US has had a varied history with the ICC. The US signed a treaty to establish the ICC in 2000, under President Bill Clinton's administration. The US said it strongly supported "international accountability" but believed the treaty, known as the Rome Statute, had "significant flaws" that still needed addressing. However, the US never ratified the treaty. In 2002, shortly before the court was formally established, President George W Bush's administration told the UN that the US would not join the ICC. President Barack Obama took a more positive approach to the ICC. He sought to develop co-operation with the ICC and sent observers to the court, although his administration also opted not to ratify the Rome Statute. As a diplomat, John Bolton was famously bellicose: he once said if the UN building in New York "lost 10 storeys, it wouldn't make a bit of difference". And he's made clear how he stands on carrot-and-stick diplomacy, saying: "I don't do carrots." As national security adviser, he's been more aggressive than the president at times - and has been reined in. On Monday, though, Mr Bolton made his first major address as national security adviser and showed he's in sync with the president. In threatening to take sanctions against ICC judges, he is helping to reinforce the president's "America First" policy.